New title from Anthony Evans! W editor will add description at a later date. Back to Life is the personal story of Anthony Evans, son of a well-known pastor, who at times struggledwith depression and feeling dead to his faith. From growing up duty-bound to his name, to his time as a finalist and then talent producer on "The Voice," Anthony has come full circle as evidenced by his same-titled latest album. In this first book, Anthony compares identity from the world's perspective, and what he experienced in Hollywood, vs what he eventually found through a renewed faith in God. He shares what his parents did right in raising him, but also where they unknowingly missed his elusive pain, and how God worked it all together to grow him into a man that is in love with life, his heritage, and his individual calling. Anthony has learned to embrace the incredible beauty of his unique voice, and in Back to Life invites readers on their own journey to do the same. 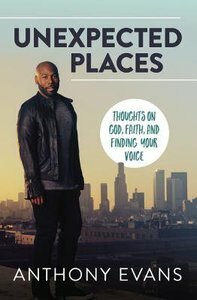 About "Unexpected Places: Thoughts on God, Faith and Finding Your Voice"
In 2001 Christian music gained a new voice when legendary innovator Kirk Franklin asked Anthony Evans to join his ministry. Evans harmonized with his mentor and friend for four extraordinary years, until the rhythm his own maturing music set in motion a solo career. Now, for a decade, Anthony has voiced the Gospel with such a melodic, thought-provoking style that he has emerged as one of Christian music's premiere male vocalists and worship leaders. A much-sought-after leader of worship, Anthony has garnered invitations across the spectrum from Franklin Graham events, to such venues as The National Worship Leader's Conference. As a live performer, Evans has shared the stage with such talents as Yolanda Adams, David Phelps, FFH and Natalie Grant. And as a composer/ artist, Anthony's crossover music has vibrated both the doors of the church and ventured beyond. inspiration. The result is a musical journey well worth taking; an adventure many worship-minded, music lovers deliberately experience, again and again.